Feyre, Rhys and their companions are still busy rebuilding the Night Court and the vastly changed world beyond. But Winter Solstice is finally near, and with it a hard-earned reprieve. Yet even the festive atmosphere can't keep the shadows of the past from looming. As Feyre navigates her first Winter Solstice as High Lady, she finds that those dearest to her have more wounds than she anticipated – scars that will have a far-reaching impact on the future of their court. Meant as a bridging book to take the original trilogy on to a larger series, I really enjoyed the size of the book. It was a nice quick read but packed full of lots of Sarah J Maas goodness. I can't wait to see more of the relationships / friendships as they progress into the next books. It's a nice book. Nothing in the way of the drama we'd seen at the end of A Court of Wings and Ruin, an not involved plot. Just a really good sort of 'check in' on the characters. I love this book series, it is beautiful, unique, imaginative and addictive! Every time I start reading one of the ACOTAR series books (whether for the first or sixth time) I can’t physically put it down until I am finished. 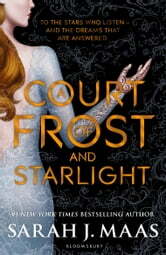 I dreamt about ACOFAS, thought about it, and wished I could be Feyre all the way through! I can’t wait for the movie to come out (as long as the characters match my mental image ;) ) thank you so much Sarah J. Mass, for putting something into my life that lights it up and entertains me. I can’t wait for the next book to come out! I highly recommend this book series and hope you enjoy it as much as I do! Thanks again! Opzich goed boek maar er zat weinig verhaal lijn in. Dit is echt een extraatje voor het wachten op het volgende boek. Niet een musthave maar zeker leuk als je wat extra info en inzicht wil op de levens van feyre, rhysand, nesta en cassian. It was amzing worth the wait. Highly recomended!! !